As you may have heard from industry events like NABShow and Social Media Marketing World, marketing dollars are switching from broadcast TV to live video streaming for more creative and targeted visual advertising. 90% of users say that seeing a video about a product is helpful in the decision-making process. 92% of mobile video viewers share videos with others. 96% of B2B brands use video in marketing campaigns. 73% report video had a positive impact on ROI. Facebook – a major site for advertising – prioritizes live videos and shows them on users’ newsfeeds before anything else. It seems most marketers are convinced video works. However, are there ways to get the advantages of live video without having a large production budget – or any budget at all? Take inspiration from the examples of successful brands and our budget-friendly suggestions below. human connection. Who prefers watching an ad to getting a recommendation from a trusted blogger or friend? Nobody. Because brands have that age-old problem social media is slowly helping to address: the faceless ‘corporate robot’ image that keeps them from engaging with customers directly. Well, not anymore, as many are embracing video as a way to form personal and personable connections with their target audience. 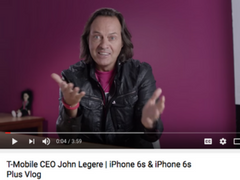 For instance, T-Mobile’s CEO John Legere regularly posts vlogs to discuss the latest in mobile tech. their press conferences to bring fans into their world and give them the latest updates. For another example, the doggy-centered monthly subscription BarkBox chose a simple yet brilliant route of live streaming puppies. Now, that’s a brand that knows their audience! The Budget-Friendly Option: In fact, this type of strategy should not hurt you financially if you stay away from overly complicated tech. If you’re a CEO who wants to add a personal touch to your content marketing, grab your own laptop or phone and advertise a YouTube Live or Periscope chat so your customers can put a face to the brand and see that you are involved and knowledgeable about your industry, and are concerned about their experiences. However, be wary of being too human and getting carried away, as John Legere did with insulting the Electronic Frontier Foundation during a Twitter Q&A. because they are building on the star power of established influencers that their audience will already be familiar with. This tactic can also be employed in different ways. For a more permanent arrangement, we can look at Amazon’s Style Code Live, which regularly invites beauty vlogger Tati Westbrook to host and has her promoting the show weekly on her own channel. 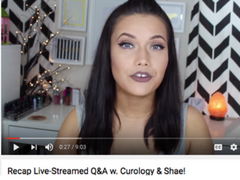 where fans could ask the vlogger and the Curology experts about the line and their skin care problems. The Budget-Friendly Option: If you don’t have the budget to regularly employ a mega-influencer with millions of subscribers, there are still ways to get your product out there through similar channels. 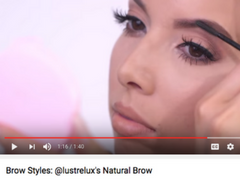 Many industries, including beauty, are already sending their products to influencers to be featured in their blogs or vlogs. For example, partnering with ‘middle-range influencers’ (those with around 100K subs) rather than huge YouTube stars means less of a strain on your budget and the chance to collaborate with more than just one influencer. Find influencers quickly using a blogger review campaign platform and request that bloggers feature your product on their own live video channels such as Snapchat and get the benefit of live video and an instant new audience without lifting a finger. If you’re thinking of whether to go for a budget-breaking TV ad or a targeted Snap campaign, perhaps you’ll be better off with the latter, seeing the success other big brands have enjoyed. Periscope has been used by big names like Adidas and DKNY to advertise and was even used by Spotify to live stream their launch. Spotify’s concert feature is another game-changer, offering customers the chance to listen to their favorite artists’ concerts via live stream. Live stream is also being seen more and more in sports, with EA Sports and the NFL streaming games through platforms like Twitter. Chicken Cool Ranch Doritos Locos Tacos, which was promoted through a short Snap film. 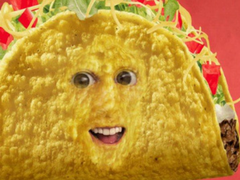 The Cinco de Mayo taco face lens was an even bigger hit, breaking Snap record with over 200 million views. The Budget-Friendly Option: Sponsored lenses like Taco Bell’s or creating entirely new live streaming options cost a pretty penny, so try starting small and seeing where this technology can take you. Create business accounts on apps like Periscope and Snapchat and advertise them on your existing channels. Encourage your whole team to get involved in thinking of creative campaigns that would inspire word of mouth. As you experiment, take advantage of free online tools, such as WeVideo, PowToon, Wideo, and Kaltura to create simple videos rather than breaking the bank on expensive professional software. Experian’s #CreditChat is a pure customer service bonanza, with the event streaming on YouTube, Periscope, and Twitter every Wednesday. A panel of experts is invited to speak on a different topic each week and give financial tips, with customers able to get their questions answered instantly. Insurance giant MetLife combined a similar strategy with influencer collaboration by hosting a webcast with parenting bloggers who asked MetLife representatives questions about life insurance. The Budget-Friendly Option: Fortunately, these types of Q&As don’t have to take up much of your budget. Shelling out on panels of experts is great but not necessarily crucial for such campaigns. A weekly Periscope session where your customers can ask questions live will be a major boon if you want to improve your customer service. Providing content that is educational rather than purely promotional also builds trust between your brand and your audience, exemplifying that you are serious about addressing their concerns. Vlogs from company representatives put a human face on a brand, encouraging audience engagement and trust. 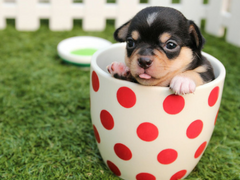 And if puppies happen to be a big, representative part of your brand? All the better. Kittens work too. Partner with influencers who have their own video capabilities to create buzzworthy campaigns. Use free apps to advertise new launches and provide exclusive content to your target demographic. Improve customer service through Q&As and other educational content that will benefit your consumers. 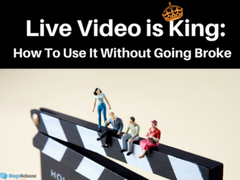 Thinking of launching your own live video campaign? Let’s discuss in the comments! Eti Nachum is the CEO of BlogsRelease, the #1 marketplace where brands can get product reviews from bloggers worldwide. Eti is a marketing professional with 20 years of experience in advertising and marketing. She likes to follow influential bloggers and works hard on bringing the blogosphere a visible platform to find the latest blogger campaigns in diverse industries. Connect with the team on Twitter @BlogsRelease, Facebook, LinkedIn, and Google+.